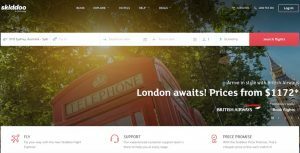 Helloworld Travel, fresh from acquiring the Magellan Travel Group, has strengthened its business by agreeing to purchase Flight Systems Pty Ltd, a provider of web-based flight booking technologies and operator of the skiddoo.com.au website. The agreement, which Helloworld said yesterday was “subject to certain pre-conditions”, comes two weeks after the Magellan Travel Group acquisition, which Helloworld said was in line with “the company’s strategic aim of further developing its leisure and corporate technologies globally’. HLO has agreed to acquire 100% of the business which will be funded from existing cash reserves. The acquisition is expected to be completed by the end of March, 2018. The business is expected to generate TTV of over AUD 80 million in FY18. Helloworld Travel Limited chief executive, Andrew Burnes, said the acquisition “would also strengthen the businesses technology suite in its corporate and leisure wholesale operations. “Flight Systems would provide the company with a low-risk and low-cost entry to some sophisticated distribution technologies to incorporate into the rapidly developing ResWorld agency platform, which is being rolled out during 2018. “Flight Systems is an established business with proven technologies and takes us significantly forward in the expansion of our system capabilities across the business” Burnes added. Flight Systems chief executive, Mirza Juddani, a well-known Sydney online travel entrepreneur, said the underlying technologies of Flight Systems would “significantly enhance the distribution of travel products through Helloworld Travel’s multiple retail and corporate distribution channels in the Asia Pacific region”. Delivering greater efficiencies for all the HLO networks. Magellan Travel Group, Australia’s premium agency network with 129 agencies located around Australia.